Microsoft is competing with Steam. 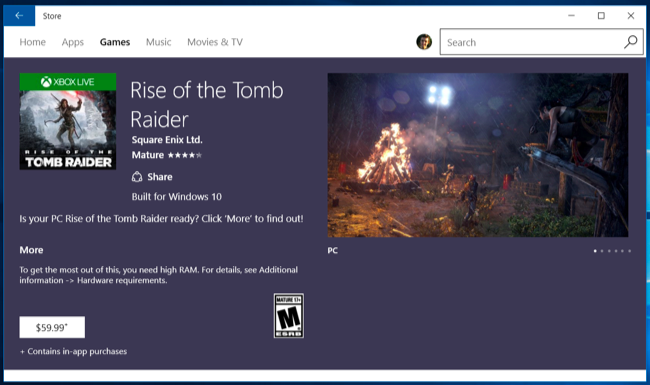 For $60, you can get Rise of the Tomb Raider from either the Windows Store or Steam. But the Windows Store’s version of the game is worse, and Microsoft’s new app platform is to blame. It’s not ready for powerful games yet. There’s no problem with getting Candy Crush Saga or other simple mobile games from the Windows Store. The Universal App Platform is ideal for simple things like that. But Rise of the Tomb Raider demonstrates just how limited universal apps are. Steam and other PC gaming services distribute games as traditional Windows desktop applications. You buy a game, it downloads the .exe or .msi installer and installs it. All apps in the Windows Store, on the other hand, are made using Microsoft’s new “Universal Windows Platform,” or UWP. That’s why there’s such a huge difference here. It’s not just the limitations of the Store itself. Underneath, you’re choosing between a “universal app” version of the game and a “Windows desktop” version of the game. Microsoft’s new app platform has improved dramatically from the state it was in back in Windows 8. But it’s still not as powerful as the Windows desktop platform. It may one day be, but it isn’t there yet. “Store apps,” as Microsoft called them back in Windows 8.1, are limited in some important ways. This doesn’t normally matter for simple apps or casual games, but it’s very noticeable for PC games. Courtesy of this discussion on Reddit, here’s a list of things the Windows Store version of Rise of the Tomb Raider can’t do. No SLI or CrossFire: If you have multiple NVIDIA or AMD graphics cards using SLI or CrossFire, the Windows Store version won’t be good for you. It doesn’t support SLI or CrossFire, although the Steam version does. VSync is Always On: VSync is designed to eliminate screen tearing, but it can have downsides–like adding input lag, or decreasing game performance. If you have the Steam version, you can choose whether or not you want to use VSync. On the Windows Store version, it’s always enabled. Always Borderless Fullscreen Mode: The Store version will always run in “borderless fullscreen” mode, also known as “fullscreen (windowed)” mode. This ensures Alt+Tab will work properly and the game won’t take over your entire display. However, it means the game can’t have exclusive access to your graphics card, so you can’t get the best possible performance. The Steam version gives you the option of using exclusive fullscreen mode. Sorry, No Modding: Windows Store apps are protected, so this means modding–one of the mainstays of PC gaming–just isn’t possible. The game’s running process is protected so applications like SweetFX can’t be used to modify its graphics. No .exe File (and No Steam Controller): You can’t launch the game directly as an .exe file. This means you can’t add it to Steam, for example, and that means you can’t use a Steam controller with it. No Overlays: You also can’t use overlays or any other software with the game. You can’t get a Steam overlay or any other type of overlay. Software like Fraps for recording your screen and tracking your framerate won’t work, either. Mouse Macros Won’t Work: Mouse utilities that allow you to create custom macros for specific games won’t work with the Windows Store version of the game. No Clear Refund Policy: Steam now has a great refund policy. It’s almost too generous. It’s no-questions-asked for the first two hours of gameplay, allowing you to refund a game for any reason. After that, you can still attempt to get a refund if you have a problem. The Windows Store doesn’t have a clear refund policy if the game doesn’t work properly–you have to chat with a representative, and who knows how that will go. Only for Windows 10: The Windows Store version of the game will only ever work on Windows 10. Buy the game on Steam and you could also play it on Windows 7 or 8. If it’s ever ported to Mac OS X or SteamOS/Linux, buying the game once on Steam will also get you those versions for free. You just get more for your $60. Some of these things may not matter to you, but you never know what features you might want down the line. And when both versions of the game cost the exact same amount of money, why would you choose to buy the version that’s crippled? None of this is just speculation. In a thread on the Steam discussion forum, a representative for Nixxes–the company developing both the Steam and Windows Store versions of the game–confirmed the problem. “Sorry, unfortunately disabling VSync is not supported in the UWP framework currently,” the representative wrote. Yes, you read that right: Even support for the Windows Store app is happening on Steam. There’s no good way for developers to communicate with their users on the Windows Store in the same way. Valve’s Steam service has locked down a huge chunk of the PC gaming market, and competition is always good. But Microsoft’s crippled Windows Store versions of games aren’t the solution. If you want more competition in PC gaming, you should bet on a competing store like GOG or even EA’s Origin. Microsoft’s Mike Ybarra promised to fix the VSync issue. Interestingly enough, he said that SLI and Crossfire do work if the game supports it. 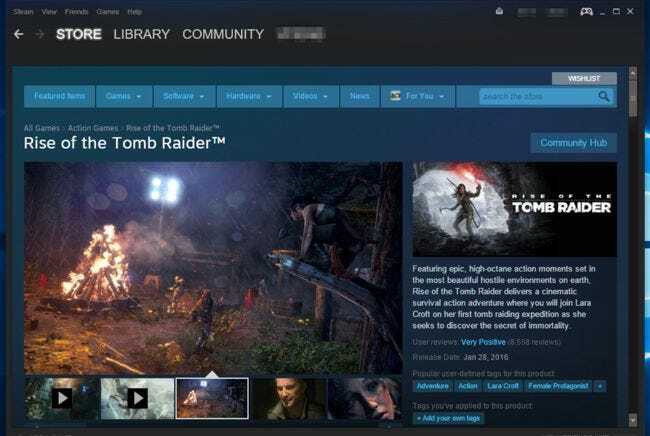 If this is the case, it’s unclear why the Steam version of Rise of the Tomb Raider supports SLI and Crossfire, but the Windows Store version doesn’t. @darkhand12345 SLI and Crossfire work, games just need to support it just as always. We will fix vsync. Rise of the Tomb Raider gives us the opportunity to compare and contrast the platforms. Microsoft has announced plans to only release Quantum Break through the Windows Store. Microsoft’s move towards the Windows Store is bad news for PC gamers who’d like any of the above features. After the failure of Microsoft’s disastrous Games for Windows Live (GFWL) platform, it shouldn’t be rolling out another PC gaming platform that causes problems for gamers.